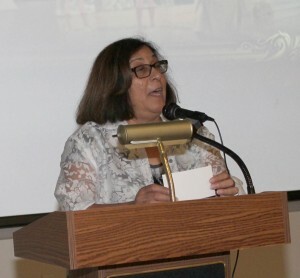 On July 24th Librarian Cindy Costales welcomed the residents and their guests to another Film History Program at the Monterey Park Bruggemeyer Library. 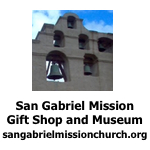 This event was co-sponsored by the Historical Society of Monterey Park. Today’s classic film “South Pacific” is a 1958 American romantic musical film adaptation of the Rodgers and Hammerstein musical South Pacific, and based on James A. Michener’s Tales of the South Pacific. The film was directed by Joshua Logan and produced by Buddy Adler. She thanked Foster Hirsch, Cindy Yee and members of the Historical Society for their assistance on this event. She introduced Foster Hirsch, a film critic from New York, who teaches at Brooklyn College. He is an alumnus of Mark Keppel High School, Class of 1961. Foster Hirsch said he always enjoys coming home to Monterey Park and the Monterey Park Bruggemeyer Library. He will continue to bring classic films to the city for the residents to enjoy and discuss the merits of each film. He said “South Pacific” was originally a stage play. The film features additional footage for “Bali Hai” and the military scenes not performed in the stage productions. The color film was shot on location in Hawaii. The musical numbers were produced in another color that surrounded the performers. Rossano Brazzi, Mitzi Gaynor, John Kerr, France Nuyen, Ray Walston and Juanita Hall had the starring roles in this production. Juanita Hall also performed her role as “Bloody Mary” on stage. Enjoy it! It is a great movie. 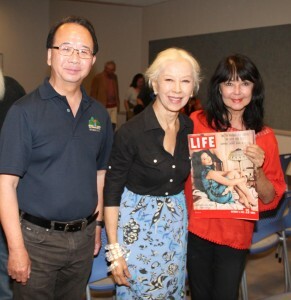 France Nuyen, a Vietnamese-French actress and model, and Foster Hirsch spoke about the movie and her starring role in this film. Ms. Nuyen stated that she wanted to be a model in New York. She said they were not looking for short, dark haired models so she got a job in a bakery. She spoke French since she was from Canada and was raised by a very Catholic grandmother. One day she got that phone call from Joshua Logan, a director. He wanted her to star in his movie version of “South Pacific as “Liat”, daughter of “Bloody Mary”. She was signed to a seven-year contract that began her career in television and movies. They spoke about her leading man, John Kerr, who she met on the set. Ms. Nuyen called John Kerr a great actor. She had lost contact with John Kerr until on day she recognized him at a gas station as they both pumped gas. John Kerr did not like acting so he became an attorney. He enjoyed practicing law better then acting. Mr. Kerr lived in Monterey Park for many years before he moved to San Marino. 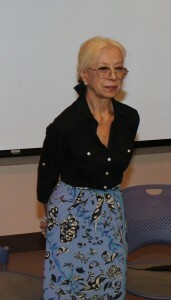 France Nuyen said Juanita Hall was the only performer to move from the stage production to the movie. She was not allowed to sing in the movie and died soon after the movie was released. Mitzi Gaynor and France Nuyen are the only surviving stars of this production. France Nuyen said while raising her daughter she saw children suffering from abuse and neglect. She began her second career as a Psychological Counselor after 35 years of volunteering. She still enjoys acting and has stared in several “Star Trek” shows as well as other movies. She said that Hollywood is finally hiring people of color. People should be cast who can make the character believable. You need to make it possible to show who you are. France Nuyen is 78 years old. She now understands old age. When you pass 60 you are not thought to be equal to the younger people. She has been blessed with her faith. We get to know more and understand you were there. It builds your sense of self. Your thoughts and choices make a difference in life. 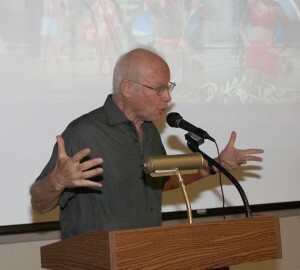 Foster Hirsch thanked France Nuyen for her attendance and words of wisdom. Cindy Costales thanked everyone for their attendance. Monterey Park Councilmember Peter Chan, France Nuyen and longtime resident Carol Sullivan pose for a picture after the movie and interview. 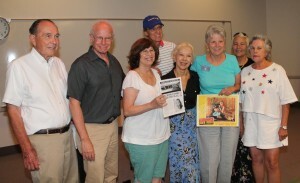 Mark Keppel High School classmates: Geri Calquhoun, Foster Hirsch, Louise Rizzi, Sally Shliff, Johnny Thompson and Beryl Walker from the Class of 1961 (Geri-Louise-Sally-Beryl are all named using maiden names) joined with Bob Low, a retired Civics teacher and France Nuyen, the guest of honor, to share a moment in history.